Laxman Utekar's directorial venture Luka Chuppi is still drawing the crowd to the cinema halls despite being in theatres for over three weeks. Starring Kartik Aaryan and Kriti Sanon in the lead, the rom-com has certainly outperformed itself at the box office now that it's eyeing to end its theatrical run between Rs 90 to 95 crore. According to trade analysts, the film was supposed to do lifetime business of around Rs 75 crore but that obviously hasn't happened which is, of course, good news for team Luka Chuppi. Utekar's directorial venture released on March 1 and since then hasn't stopped raking in moolah at the ticket windows. 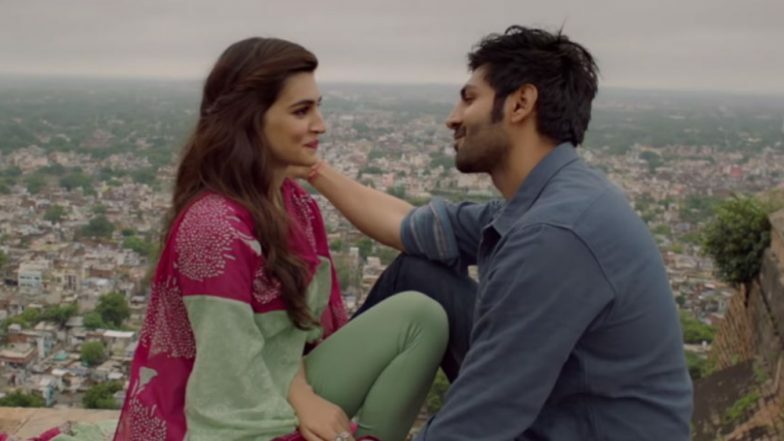 Luka Chuppi Box Office Collection Day 21: Kartik Aaryan and Kriti Sanon's Film Fares Well in Week 3, Rakes in Rs 86.99 Crore. Film trade analyst Taran Adarsh took to the microblogging site Twitter a while back and announced the updated figures. He wrote, "#LukaChuppi manages to hold pretty well, despite #Kesari, #Badla and #CaptainMarvel dominating the marketplace... Should comfortably sail past ₹ 90 cr... [Week 4] Fri 61 lakhs, Sat 81 lakhs, Sun 97 lakhs. Total: ₹ 89.38 cr. India biz." He also tweeted, "#LukaChuppi⁠ ⁠biz at a glance...Week 1: ₹ 53.70 cr, Week 2: ₹ 21.54 cr, Week 3: ₹ 11.75 cr. Weekend 4: ₹ 2.39 cr. Total: ₹ 89.38 cr. India biz. SUPER HIT." Luka Chuppi, which is Kartik's biggest opener to date, also features Aparshakti Khurana, Pankaj Tripathi and Vinay Pathak in important roles. The film is produced by Dinesh Vijan under Maddock Films. Luka Chuppi Box Office Collection Day 19: Kartik Aaryan and Kriti Sanon Starrer Romantic Comedy Rakes in Rs 85.19 Crore. Kartik and Kriti starrer was also supposed to release in Pakistan but Vijan stopped its release due to the Pulwama terror attack. Kartik who has been enjoying a good run at the box office lately has two new interesting films lined up. While one is the remake of Pati Patni Aur Woh starring Bhumi Pednekar and Ananya Panday, the other is Imtiaz Ali's untitled project alongside Sara Ali Khan and Randeep Hooda.